Today will be mostly sunny and breezy with temperatures in the lower 90s. Today will be mostly sunny and breezy with temperatures in the lower 90s. Heat index values will make it feel like the 100s again. There will be a high risk of rip currents for Miami-Dade and Broward County beaches. Afternoon thunderstorms will move inland toward the interior and Gulf coast. 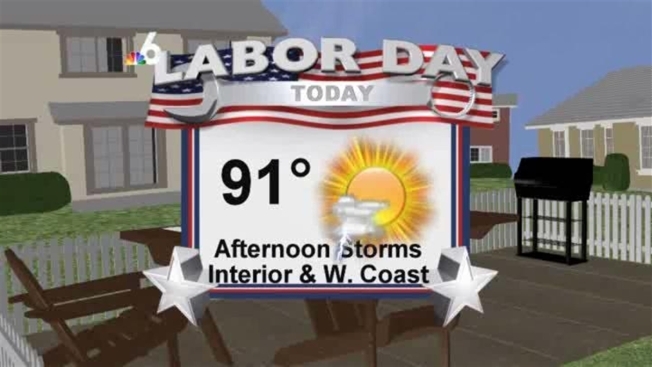 For Labor Day an east breeze will push all thunderstorm activity further inland toward interior areas again. Temperatures will be in the low 90s under mostly to partly sunny skies. Rip currents will again be possible. Moisture is expected to continue to increase as a system over the Bahamas moves toward us by the end of the week. An unsettled weather pattern is expected for the second half of the work week.